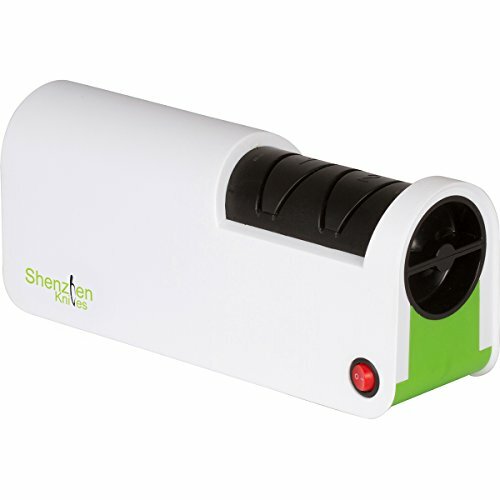 High powered, electric ceramic knife sharpener (input: 100-240V~50/60hz). It measures 3.75" x 8.75" x 2.75". The plug-in, electric powered diamond wheel ensures a consistently sharp ceramic blade edge compared to battery powered electric diamond wheel sharpeners. The Universal Knife Guide Slot accomodates most ceramic blade, heel, bolster and handle designs allowing for tip to handle sharpening. The sharpener comes with two settings, Fine (#800 grit) and Coarse (#600 grit). It creates a traditional V bevel edge (Coarse setting: 36°, Fine setting: 40°). The diamond grinding stone can grind chips of up to 1mm off a ceramic blade (grinding time can vary from a few seconds to a few minutes, depending on how large the chip/nick on the blade). Removable diamond wheel cartridge and cover for easy cleaning. The diamond grinding wheel catridge is replaceable (replacement catridges can be purchased separately). This sharpener can also be used on steel kitchen knives, but is not recommended for single bevel, compound bevel, serrated or non-kitchen knives (hunting knives, folding knives, pocket knives etc). NOTE: If you are not sure if your knife blade and handle design will fit the knife guide slots, just email us at our Shenzhen Knives company website. And if your knives don't fit our knife guide slots and can't do tip to handle sharpening, you can return the product for a refund. 100% satisfaction guaranteed, risk free policy. Shenzhen Knives is the leading online brand of ceramic knives and ceramic cutlery accessories.